Move 4 Less has partnered with Three Square, one of Southern Nevada’s most effective and most admired community organizations dedicated to solving the hunger problem in our region, to help collect and deliver food to carry out their very important mission. As our moving business has grown and thrived in Las Vegas Valley over the years, we seek ways to demonstrate our gratitude by working with community groups to help those in need in our community. So we’re pleased to let everyone know we will be working with Three Square to collect and deliver pantry food that we collect as we carry out our many moves around the valley. Many of our clients have expressed an interest in donating the extra cans and boxes of non-perishable food they may have in a cupboard rather than packing them up and moving them. We’re happy to collect and deliver them to Three Square where the food will be made available to Three Square’s partner organizations that carry out the vital work of providing meals to food-insecure families throughout Southern Nevada. 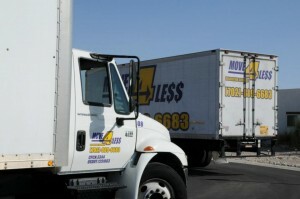 In addition to our pantry food donation program, Move 4 Less will be providing Three Square with use of a truck and driver on an as-needed basis for bulk collections and deliveries. Having reliable transportation can be an important factor in getting food to where it is needed most across our large four-county Southern Nevada community. Three Square is a key partner to Southern Nevada’s food security network of organizations that help feed the over 300,000 residents who are unable to obtain nutritious food for themselves and their families. Three Square coordinates obtaining food and donations to fund the vital work of organizations that feed children, families and seniors across the valley and in our rural communities. They maintain a pantry providing both perishable and non-perishable foods that are made available to these programs, and sponsor programs like the Backpack for Kids program to get food to children in our local schools. Three Square plays a vital role in the community and we are proud to be able to help support their mission to end hunger in Southern Nevada. As a local moving company with our roots right here in Las Vegas, Move 4 Less supports a number of local non-profits to highlight our commitment to our Las Vegas neighbors. When we can use our talents, our dedicated team members and our moving trucks, to help out the community, everyone wins. We encourage our clients to keep helping Three Square and other local organizations that feed the hungry in minds, not just during the holidays, but all year round. Together we can lift up Las Vegas Valley and move all of us forward together.